Islington, Farringdon and Clerkenwell's favourite hairdressers in Exmouth Market EC1. 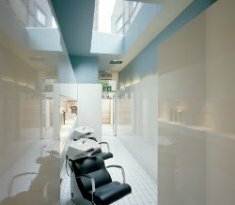 the klinik hairdressers are the premier hair salon in Islington. Located near Holborn and Angel Tube Stations in the lovely Exmouth Market, the klinik opened to the public in September of 1998. The design was developed by Block architects and Anna Forsling the salon owner. Based in the heart of London's EC1, its modern, exciting and new design was created with the idea to show each client a three-dimensional view of their new hair design throughout their visit. Each styling unit has a tall, slim mirror specially designed to hold a TV monitor providing the client with a natural line of view from the cameras that hang above. At the klinik we are a team of senior stylists that provide everything from cutting to all technical work. We pride ourself on our high standard of service and offer all our clients free consultation and free fringe trims between their visits. We look forward seeing you at the klinik!